Taxi aggregator Ola has launched a new class of 'Micro' cabs, which have a base fare ranging from Rs. 35 to Rs. 45, at rates of Rs. 6 per kilometre. The Micro class of vehicles include compact cars like the Hyundai Eon, Wagon R, and Datsun Go, now available for bookings in Delhi, Mumbai, Kolkata, Bengaluru, Chennai, Pune and Hyderabad. The launch of the new fleet seems like an attempt to undercut the prices of UberGo, Uber's cheapest class of cab available in the country, which ranges from Rs. 6 to Rs. 8 per kilometre. As we had noted earlier, UberGo seemed like the best go-to option for cheapest cab rides in the city, excluding ride-sharing options. A closer look at the fare charts reveals that the ride time charges and per kilometre rates are consistent across these cities, at Rs. 1 per minute, and a price of Rs. 6 per kilometre. 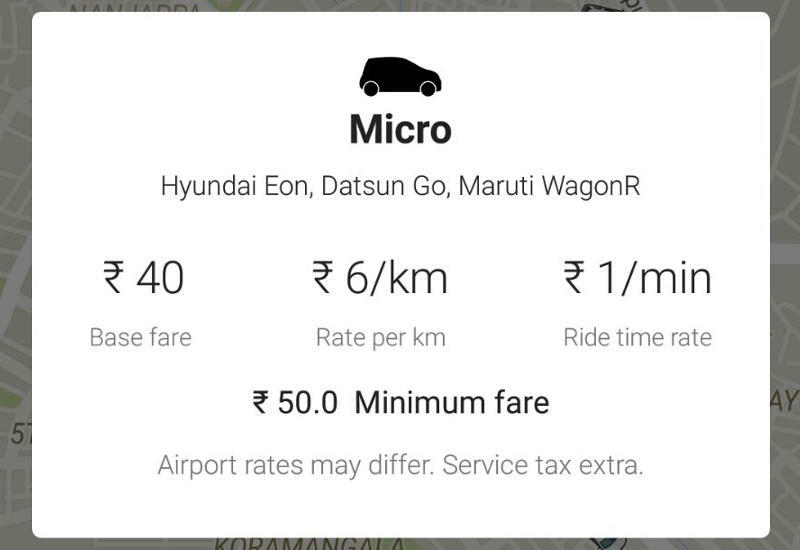 The minimum fare is Rs. 60 in Delhi, and Mumbai, Rs. 50 in Bengaluru, Chennai, Pune, and Hyderabad. Ola's services are available in over 102 cities, and has a fleet of over 350,000 vehicles, include government-licensed taxis and auto-rickshaws. Its competitor Uber is operational in 26 cities and has over 250,000 driver partners in the country.